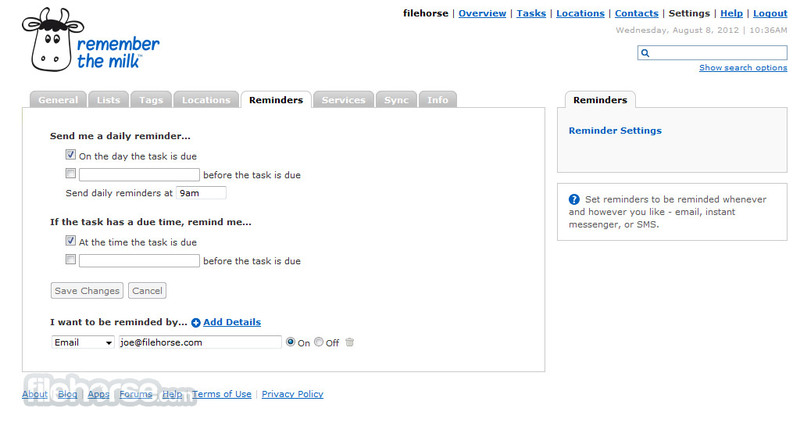 Remember The Milk is online to-do list service application with a great name that you will never forget. If you already have desktop version of this great program, you will be amazed about how many of its features are linked to the online enviroment. Web version of Remember The Milk is tightly integrated with your social network accounts and mobile devices, gaining additional ways of contacting you and reminding you about your upcoming tasks and shopping lists. With online version of Remember The Milk, you will always be in contact with your to-do list. Simple but effective online task manager! Task managers come in many shapes and forms, with many web-tools trying to integrate their scheduling services into every possible internet-connected platform. The leader in that field is none other than Remember the Milk, lightweight but very functional web application that is perfect for everyone. Complete to-do list service! Remember the Milk is one of the first big task and to-do list managers that succeeded in capturing the worldwide attention by being extremely open to porting its service to every possible internet-connected platform our world knows. 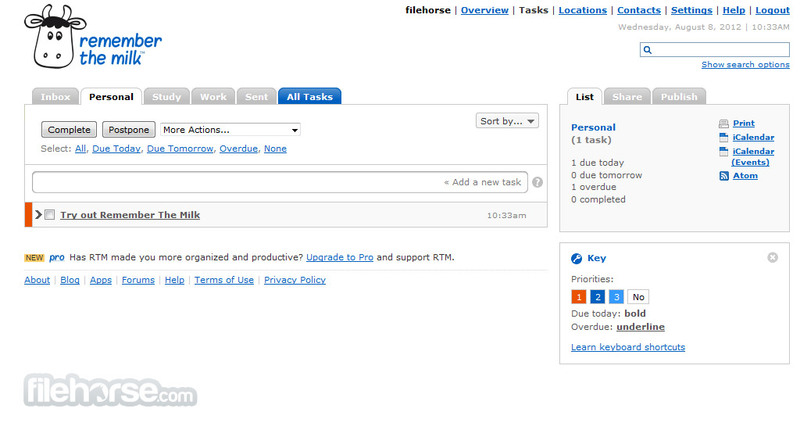 Even though its basic web interface serves as its core, offering great tools for everyone to manage their calendar, task, notifications, and to do lists (both for personal use and for team use in companies), this service built by only two people very quickly managed to expand its influence and provide millions people with task management services that can rarely be found anywhere else. In addition to web interface that anyone can access from Windows, Mac OS X and Linux browsers, Remember the Milk also has large network of official apps for Android, iPhone, iPad, and Blackberry. But that’s only the beginning. Remember the Milk notifications can be added and managed with voice using iOS Siri, you can use web interface to manage Evernote reminders, access RTM tasks from Gmail, sync data with Microsoft Outlook and Google Calendar, and even use RTM capabilities from inside many other standalone desktop apps (Rainledar, MilkMaid, Gmilk…) and browser extensions. If you are true professional, you can even access Remember the Milk data from command line clients. Even though Remember the Milk is perfectly usable with a free account, professional users can extract more productivity from it if they pay for premium service that will enable real-time sharing of data with multiple devices more than once per day. Web interface of the Remember the Milk is not the prettiest one you can find with modern task managers, but the developers of this app don’t want to make too many changes for the service that served loyal users for more than 10 years now. 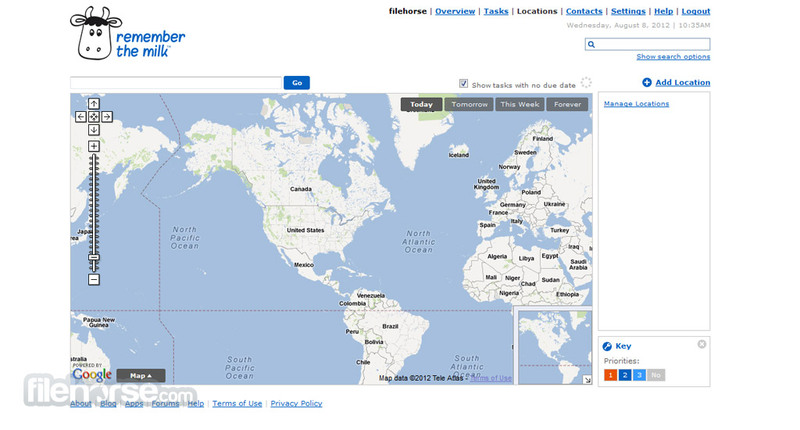 Dashboard is very simple and intuitive, very reminiscent of the ordinary web page layouts of the pre-web2.0 age. Main screen lists three set of tools that can be activated – at the top of the app are main controls (Overview, Tasks, Locations, Contacts, Setting), majority of the screen is taken up by task listings that can be filtered by Inbox (messages), Personal,Study, Work, Sent and All Tasks, while on the left a smaller widget can be used for listing data about your new tasks, Share tools and Publishing tools. Overall, interface of this app is easy to use and functional, but will not be attractive to users who have gotten used to modern website designs. Complete to-do list service! Remember the Milk has great free version of the app, which offers no restrictions to the amount of tasks you want to manage or type of access you want to have to your notification service (cross platform OS support, portable devices, 3rd party integrations…). Premium version enables better data syncing between various devices, enabling you to always be up to date with your to-do lists. Remember the Milk is perfect application for everyone who wants to get full control over their tasks and to-do lists inside simple and easy to manage web application. With great tools, integrations and OS/device support, this app can help anyone’s day and work go faster and more productive.